Upcoming- Breaking News: Journalism in Classic Film Blogathon! Comet Over Hollywood and Lindsay’s Movie Musings present the Breaking News: Journalism in Classic Film Blogathon! 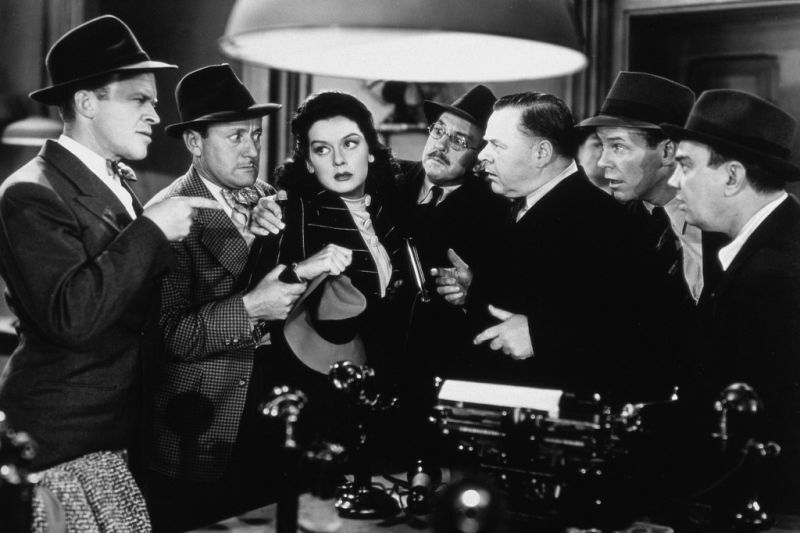 What: Classic films are filled with stories featuring journalists and journalism. Being newspaperwomen ourselves, Jessica and I wanted to feature the roving reporters of classic film. Once you’ve picked your movie, shoot either Jessica or Lindsay a comment on this post with your film or topic and blog. We’ll compile a master list and assign everyone one of the two days. During the blogathon, we’ll publicize your posts on our blogs and on Twitter. We’ll keep a growing master list up on our blogs leading up to the blogathon so you can see what films/topics have been taken, as it’s preferred that there are no repeating topics. Banners for the blogathon will be coming shortly. 25 Responses to Upcoming- Breaking News: Journalism in Classic Film Blogathon! Count me in! I’ll write about WOMAN OF THE YEAR (1942) with Katharine Hepburn and Spencer Tracy. Great! Look forward to reading your post! Got it! That’s a great topic, and two fantastic films. One of my favorite films! Glad you’re joining us! Could I do Teacher’s Pet. Great theme. Awesome! I’ve never seen that movie, so I look forward to reading your post! Hi Lindsay! I just left a comment at Jessica’s site, asking if I could do “The Trial of John Peter Zenger”. It’s a 1953 episode of the Studio One series. This one is about a libel suit brought against a newspaper publisher. I talked to Jessica, and that’s fine. Glad you’re joining us! Oh shoot, I can’t pass up a good blogathon when I see one. Do you think my sister and I can have dibs on “Libeled Lady” ( 1936 )? Our site is Silver Scenes ( http://silverscenesblog.blogspot.com ). I’m surprised nobody took Roman Holiday or the all-time classic newspaper film….Citizen Kane! Awesome! Happy to have you join in the fun! Look forward to reading your post. Ok: I TOTALLY missed this announcement. Maybe because it was during SUTS. The blogathon will be when I’m in Disney World, but I’d love to do something. Hmm…let me get back to you? Ok, then. Tentatively put me down for either 30 Day Princess or Wedding Present. In both, Cary Grant is a newspaper man. I will try really hard to get this out before the trip. It’s a crazy week coming up! I’m kicking myself for missing this! Great! And no worries, just keep us posted and we’ll get it promoted! Got you down for Citizen Kane 🙂 Thanks for participating, can’t wait to read your post! awww snap! now I have to write it 🙂 Should the banners link to any specific page on one of your sites? Hi Chris! I’m sure it will be great! I’d say maybe link back to this page, that way anyone can see what the event is about, and all the participants. Thanks!